Since 1975, half of the Saharawi population has lived under Moroccan occupation, subject to systematic human rights violations. Their situation was particularly difficult during the reign of King Hassan II, known as the Years of Lead, when around 650 Saharawis disappeared. 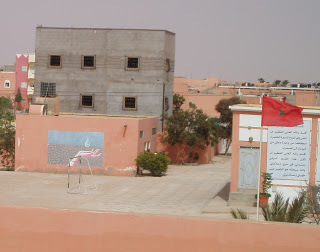 In 1999, the new king Mohamed VI started a process of acculturation, denying the existence of a unique Saharawi identity. Any type of resistance has been answered with repression, police harassment, arbitrary imprisonment and torture. In addition, the natural resources of Western Sahara are exploited without benefit for the Saharawi population. The Moroccan authorities have made it very hard for independent observers and journalists to go into the territory. 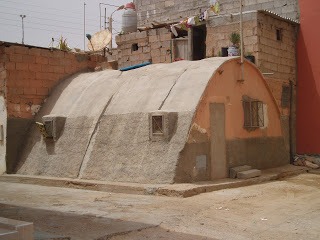 Nevertheless, modern technology has enabled the Saharawis to break the media blockade. In recent years, a new generation has openly defied this situation, organizing peaceful protests under the leadership of activists such as Aminetu Haydar. 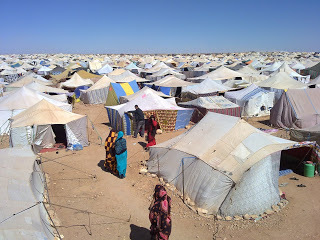 In October 2010, thousands of Saharawi civilians set up a camp in the outskirts of the occupied city of Layaaoune, which were said to be the biggest peaceful protests since Morocco occupied Western Sahara in 1975. Regarded by some as the inception of the Arab Spring, Saharawis were calling for an improvement in their living conditions and demanding the long-overdue, UN-backed right to a referendum on the issue of self-determination. The dismantling of Gdeim Izik on 8th November 2010 resulted in dozens of deaths, imprisonments, injuries and forced disappearances. Moroccan authorities said 11 people died in the violent events, among them members of the security forces, and 70 were injured. 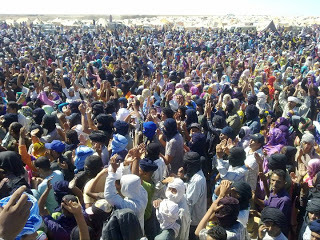 These figures were used to condemn the 24 Saharawi protesters in February 2013 without an independent investigation into the aforementioned events. Some of the convicts were well-known human rights activists and had in the past openly voiced their pro-independence stance. One of them is Sidahmed Lemjiyed, the President of the Saharawi Committee for the Protection of Natural Resources, who has now been sentenced to life. ​In the days leading up to the trial, the European Parliament had called for the release of the Saharawi political prisoners. Amnesty International had issued a statement, labelling the trial flawed from the get-go. European observers who witnessed the trial noted many anomalies; delay of detention without trial beyond the legal limit of 12 months, trial of civilians in a military court, confessions obtained under torture and signed with a thumb print only, etc. The final evidence given to prove the prisoners guilty was a picture of some of them a few years back with Mohamed Abdelaziz, Secretary General of the Polisario Front, which did nothing but to emphasise the political character of the trial, something consistently denied by the Moroccan authorities. The Spanish Member of the European Parliament and the European Parliament’s Commission for Legal Affairs, Antonio Masip, who attended the trial, sent a letter to UN Secretary General, Ban Ki-moon, denouncing the lack of human rights mechanisms in the UN Mission in Western Sahara (MINURSO), which constantly witnesses the “flagrant violation of human rights before their eyes”.